Team Novo Nordisk will race the 2018 season wearing custom cycling clothing designed by Italian company GSG. GSG’s dedication to creating high-end custom cycling clothing that blends aerodynamics with comfort gives our athletes the best support in their apparel as they race around the world to inspire, educate and empower everyone affected by diabetes. Team Novo Nordisk, the world’s first all-diabetes professional cycling team, and Giessegi Srl (GSG), a global leader in sportswear announced a new partnership naming GSG as the official on-bike apparel supplier for Team Novo Nordisk. 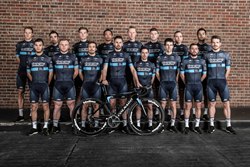 GSG will provide a complete line of technical apparel for the men’s professional and development squads. Giessegi Srl is a company founded in 1984 by Simone Fraccaro, professional road and track rider in the 70s and 80s with Moser and Saronni. The company is nowadays one of the five leading manufacturers of custom bike wear in Italy. Giessegi delivers its products to customers across over 40 foreign countries, on all continents. Their main target is to develop for any cycling enthusiast a complete range of clothing, using all innovations available and testing in the most challenging races. For more information, go to http://www.giessegi.com.